In the early days in St. Petersburg Ouspensky asks Gurdjieff about the origin of the teaching he brings. Gurdjieff tells him the teaching is complete in itself and wholly independent of the other major teachings. 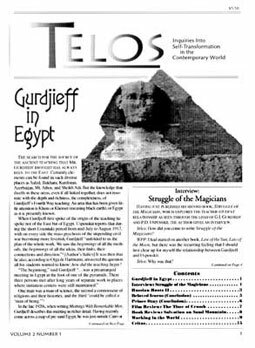 Its origin, Gurdjieff says, is "pre-historic Egypt." An interview with the author of Struggle of the Magicians, which explores the teacher-student relationship as seen through the lives of G.I. Gurdjieff and P.D. Ouspensky. Gurdjieff's Legominism is deeply rooted in Russian history, language and sayings of popular wisdom. Joyce Collin-Smith remembers the last years of Rodney Collin, Ouspensky's close student and her mentor as well as brother-in-law. Collin wrote The Theory of Celestial Influence and she notes the role the planets played at the end of his life. In his book The Unending Quest, the Englishman Paul Dukes relates his last encounter with 'Prince Ozay' in St. Petersburg. The documentary Crumb shows us the world of the cartoonist Robert Crumb, who draws images out of his sexual distortion. How to deal with influences of this kind so we don't "soil the purity of our brains?" We must learn to censor ourselves. Journalist Dennis Covington steps into the world of the unknown, into the world of snake-handling believers, where he tastes the sacred. Ouspensky's theory on the arrested evolution of ants and bees offers insight into the potentially disasterous physical and spiritual consequences of genetic tinkering with the human bodythe essential vehicle of self-transformation. Tidbits gleaned from the world and the Work.